I wish to extend my warmest congratulations to all those who passed the first ever board exams for psychometricians and for psychologists, and to all the other professional psychologists and psychometricians taking their oath today. 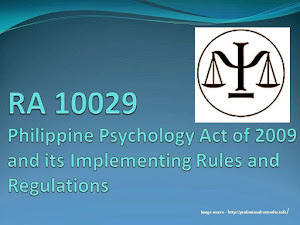 The passage of R.A. 10029 or The Philippine Psychology Act of 2009 ushered in a new stage in the development of the psychology profession in the Philippines, with the national government regulating the practice of psychometricians and psychologists. This act that regulates our profession is a clear statement of how our nation’s leaders recognize the important role of psychometricians and psychologists in nation building. We should bear in mind that the Philippines is presently the only Asian country where the government recognizes and regulates the profession of psychology. And in a recent meeting of heads of ASEAN psychology societies, the Philippine Psychology Act was closely studied by our ASEAN neighbors; and for this the Philippine psychology community should be proud of this significant and historic milestone of Philippine psychology. Now, YOU are part of this milestone. Or let me correct that. 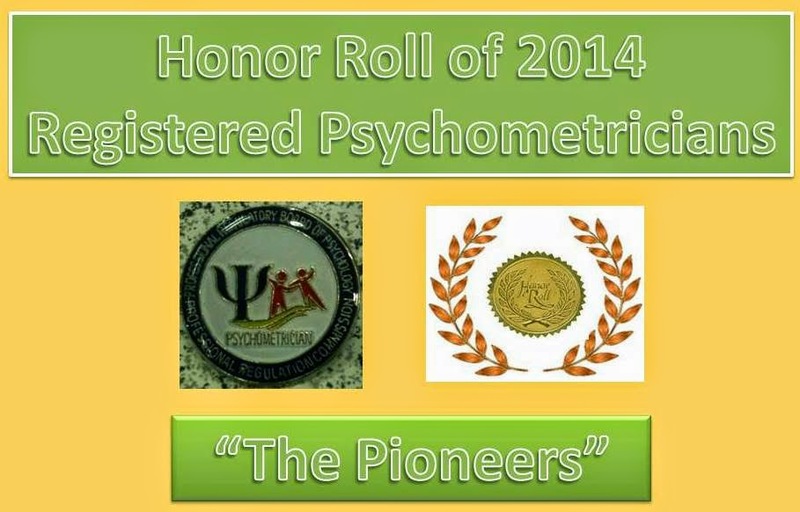 Your passing the first board exams for psychometricians and for psychologists is a new milestone in this milestone. 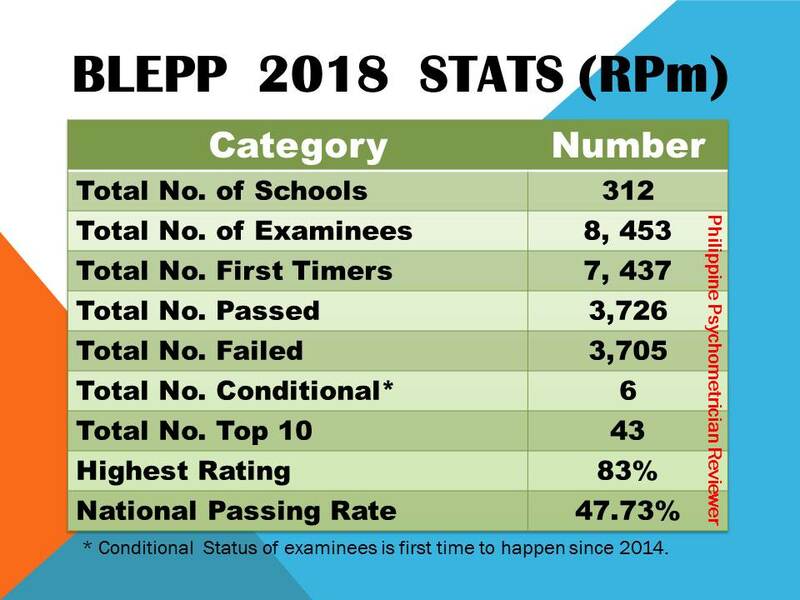 Although there are a good number of psychometricians and psychologists who have been licensed without examination even before you took the board exam, there is something truly extraordinary in your taking part in the board exam. For one, it demonstrates how foolishly courageous you are! While many others chose to wait it out, and see how the first exam goes, you took a big risk and went ahead (some would say crazily) into unknown territory. So I salute you not only for passing, but also for your extraordinary courage. But more importantly, your taking the exam is a bellwether of a permanent change in the landscape of psychology in the Philippines. The permanent change involves a concerted effort to improve psychology education and teaching, upgrading the standards of professional and ethical practice, all of which would contribute to the continuous growth of psychology as a respected scientific discipline and profession in our country. Your passing the exam and your taking the oath today means that there is no turning back to the progress in the professionalization of psychology in the country. Today’s event signals to all members and stakeholders of the Philippine psychology community that we psychologists take our profession seriously, and we cherish our various responsibilities in our different communities and societies. But let us consider what this all means. What does it mean to be a registered psychometrician or registered psychologist? What does it mean to be charged to execute our responsibilities as licensed professionals? For some of us, they will reduce this achievement to tangibles – the PRC pin, the professional ID card with the registration number, the letters that they can add to their professional titles (RPM, RPSY), which were obtained after filling up documents, photocopying them, signing these, affixing the thumb marks, cueing in many lines, making several payments, and so on. These tangibles of being a registered professional are important because of what they represent. And I hope you value what they represent more than the pin, those letters after your name, and the ID with your registration number. Let me share with you what I think this professional registration means. 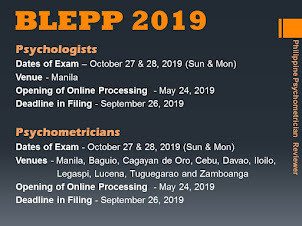 In essence, your professional registration as psychometrician or psychologist means that you are now part of a community of Filipino psychologists. Who is in that community? That’s the person sitting next to you and across you. That also includes your former professors who were previously licensed without examination (although let’s assume they would have also passed the exam if they took it). The community also includes your colleagues, your former colleagues, and all your future colleagues in the various professional fields of psychology. The community would also include psychometricians and psychologists in various provinces and regions of the country, working in clinics, hospitals, schools, community centers, organizations, and so on. 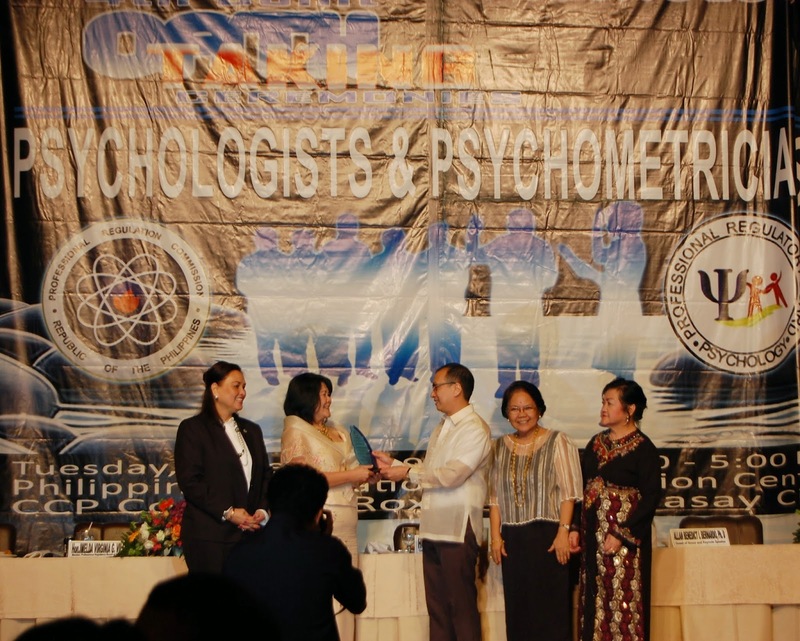 The community often comes together in the Psychological Association of the Philippines, whose members and leaders are also part of the community. Now that may all sound rather obvious, so let me give you a bit of an historical background about this community and why it sought to be recognized as a regulated profession. The first attempt to get Filipino psychologists registered was in the early 1980s in the last years of Martial Law, in was called the Batasang Pambansa. The motivation for this was a threat. There was word that the Philippine Medical Association wanted to restrict the provision of psychotherapy and other mental health interventions to licensed medical professionals. Unfortunately, that initial attempt to enact a law to regulate the practice of psychology did not prosper; and it did not prosper for another 25 years or so. But fortunately, the Philippine psychology community was left to do its own unregulated thing. What galvanized the Philippine psychology community again was yet another threat. The passage of the Philippine Guidance and Counseling Act in 2004 threatened the practice of many Filipino psychometricians and psychologists, as the IRR of that law restricted the provision of services such as counseling and psychological testing to licensed guidance counselors. 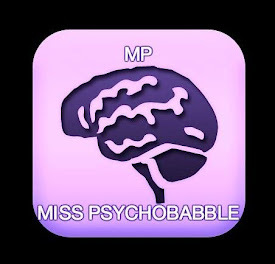 I remember the anger and the frustration when our colleagues in the guidance counseling profession were telling trained psychologists that they cannot do psychological testing; and telling us, “You will be fired,” and worse, we were told, “You will be put to jail because that is the law.” Fortunately, no one was put to jail, although some did lose their jobs. I tell you this history not to speak badly of guidance counselors, who to this day are our important partners in the mental health community. I tell you this history because the Philippine psychology community, organized by the Psychological Association of the Philippines responded most positively to this threat, to what could be seen as some form of bullying of the entire profession. Yes, we were angry; we were frustrated; we had to shout, scream, and vent our frustrations somehow. But we were not hopeless; we did not cower; we did not surrender. Instead the leaders of our community strategized, developed many alternative plans, and forged new alliances. Fortunately we found allies, in persons like Cong. Anna York Bondoc. We also learned to tentatively resolve differences within our community. We came together in our own haphazard way. We responded positively as a community, and the Psychology Bill became the Psychology Act, and fast forward... we are here today. Here we are today, a community that has perhaps reluctantly come together as THE community of professional psychologists in the Philippines. We are still a community with internal conflicts; there are still issues that we all do not agree; and there will be other concerns, big and small, that will challenge our community in the future. But the milestone of RA10029, and the milestone of your oath-­‐taking today tells us that we CANNOT ever let any issue divide our community again, because we saw what good can come from uniting together as one psychology community. As a community, we should strive to find solutions and forge compromises regarding problems and issues that will confront us in the future. RA10029 not only recognizes the important role of psychometricians and psychologist for nation building. More importantly, RA10029 articulates a clear mandate for all psychometricians and psychologists to actively take part in these processes of building communities, organizations, programs, and of building and helping people. To realize this mandate, all registered psychometricians and psychologists are called upon to actively engage this community. Do not take your PRC ID and then just do your own thing, thinking that you now have the license to do just that, your own thing. Part of the mandate of RA10029 is call to professional citizenship. You are citizens of this professional community, and there are certain values and expectations that should guide our professional citizenship. There are many values, but I would like to emphasize just three value pairs this afternoon, three pairs of values which I know are very closely related to each other: ethics and professionalism, excellence and cultivation, and empathy and responsiveness. First, all licenses are governed by ethical codes. Psychologists in the Philippines had ethical guidelines even before RA10029. Part of your professional citizenship is to know the general principles and the specific guidelines of this code of ethics. But this part of your professional citizenship cannot be a simple cognitive understanding of the document; instead, a good professional citizen of the Philippine psychology community lives and breathes the provisions of this code of ethics, advocates the code of ethics in all venues and forums, and calls attention to breaches of the code when confronted by such. It is in your advocacy and exemplification of the provisions of this code that you become the ethical professional psychologist. Ethics and professionalism. Part of the code of ethics refers to competencies – that it is unethical for a psychologist to provide services and undertake professional acts for which he/she does not have the appropriate training and competence. The board exams that you just passed assures as that you meet minimum competencies to provide psychological services. But let us keep in mind that the science of our profession is growing in leaps and bounds; new theories, interventions, tools and techniques are proposed and studied constantly. As such, it is the responsibility of a good professional citizen of the Philippine psychology community to constantly cultivate his/her knowledge and skills as a psychology professional. 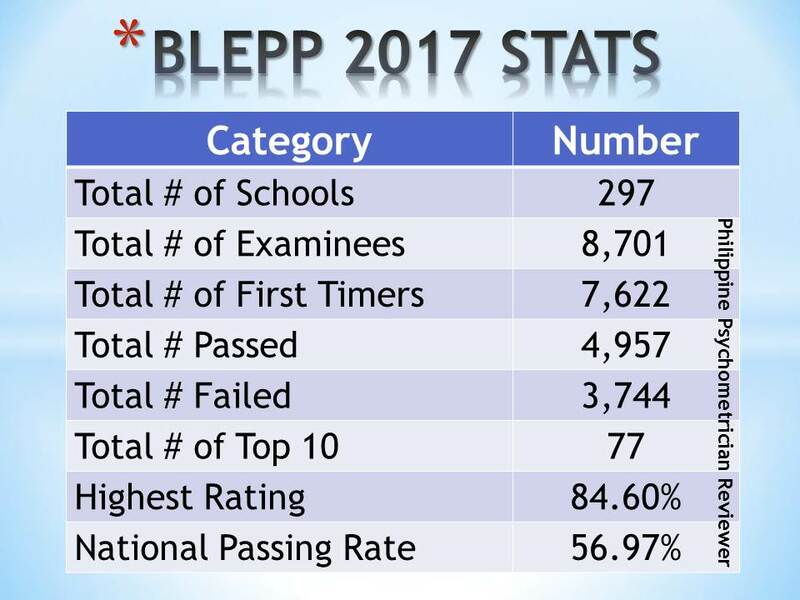 The fact that you passed the board exam should not be a license for you to say you know enough; instead, the fact that you passed the board exam means that you know enough to start learning more and more. Excellence and cultivation. Why do we need to have such high aspirations and to continuously cultivate our skills? Because we have communities, organizations, and people we serve. And very simply, we cannot fail them -­‐-­‐ but that is such an avoidant position. As a community of professional psychologists our goal should not be just to avoid failing our stakeholders. 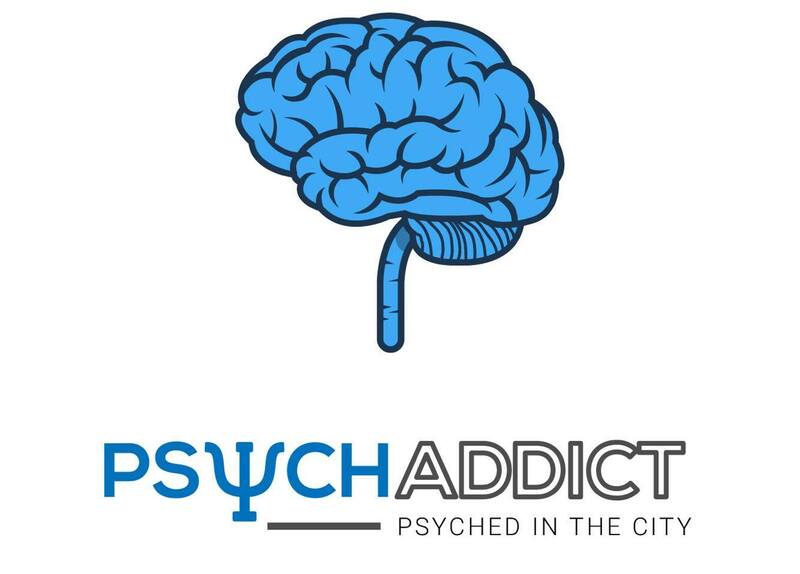 Instead our goal is to provide the best that the fast growing science and profession of psychology has to offer to our stakeholders, because we care about our stakeholders. We want our communities to thrive, we want the organizations we serve to meet their high aspirations, and we want the individuals we help to solve their problems and to flourish. Excellence and cultivation is not a personal conceit. We strive to be better because we empathize with the plight of our stakeholders, and we want to be responsive to their needs. We do not serve our stakeholders with a high sense of self-­‐ importance; instead we subordinate the esteem we have as professionals to help our stakeholders attain their important goals. Also remember, that our stakeholders’ goals are defined within a rather problematic society; a society that experiences vast social inequalities and injustices, where opportunities for growth and personal development are not equally distributed, where individuals, families, and organizations face numerous stressors and risks, where many people voices are silenced by oppressive structures in our social system, where many people in the margins have not found their voices at all – AND where highly educated psychometricians and psychologists like you are among the privileged. We can make a difference in the lives of others, if we chose to, with empathy and responsiveness, with excellence and cultivation, guided by ethics and professionalism. Three value pairs that I hope will be your guide in your journey of good professional citizenship; a journey that “officially” begins today with your oath – a journey that you will begin with a strong sense of pride. 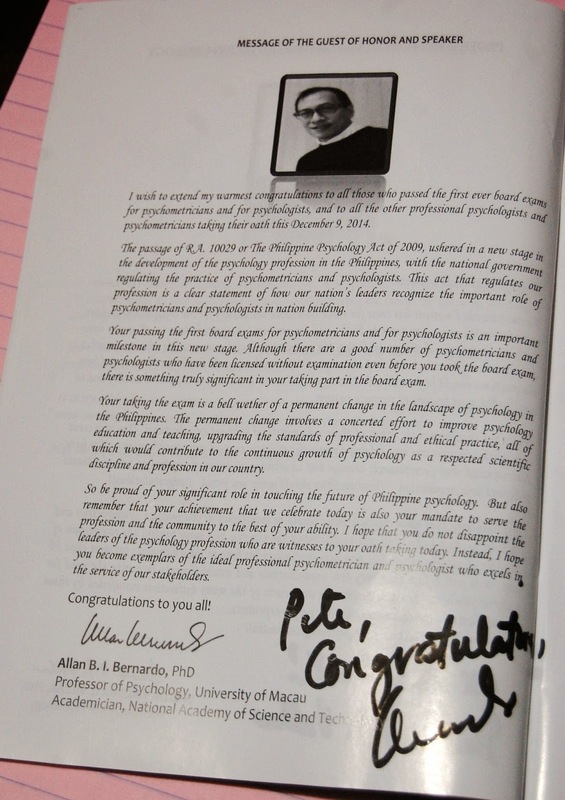 Yes, you should be very proud of your significant role in touching the future of Philippine psychology. But that role is not limited to your activities in today’s celebration. That role in touching the future of Philippine psychology is a lifelong role. Because you should remember that your achievement that we celebrate today is also your mandate to serve the profession and the community to the best of your ability. I hope that you do not disappoint the leaders of the psychology profession who are witnesses to your oath taking today. I hope you do not disappoint our advocates like Dr Anna Bondoc and the other former leaders of the PAP who have worked hard to get us where we are now. 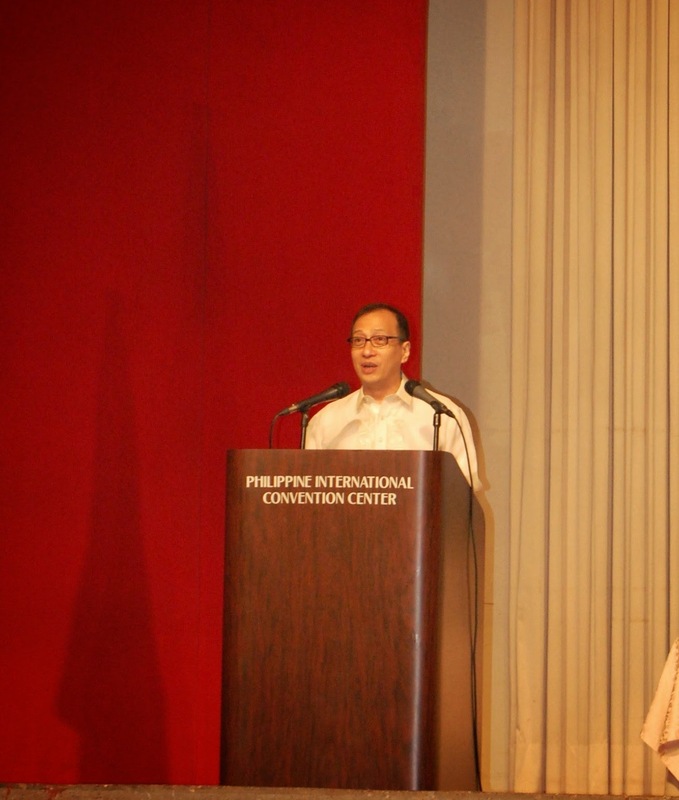 Instead, I hope you become exemplars of professional citizenship, and in your becoming so, you are truly helping build a stronger community of Philippine psychologists that is more united even amid its diversity, a community that will not only act when it is threatened, but will be proactive and animated in being a force for a good and just society. You will hopefully be a very outstanding citizen of the professional community of Filipino psychologists that serves its lawful mandate with utmost conviction. When you all take your oath this afternoon, you will be changed. But more importantly, remember that you are now licensed to be agents of change for the people you work for. For me that is a most exciting thought. And so I have to congratulate you all once more, and invite you to form and reform our Philippine psychology community, and together, let us touch the future and make it better. Maraming salamat Dr. Bernardo for sharing with us your keynote speech on the 4th Joint Oath Taking Ceremonies for Psychologists and Psychometricians. Mabuhay po kayo! Post by Lea Katrine Sabilla.